Almond meal is sometimes referred to as almond flour or ground almond. It is made from ground sweet almonds. 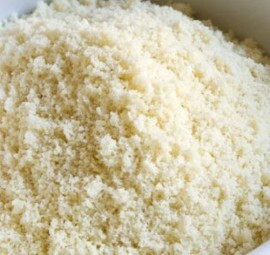 Almond flour is usually made with blanched almonds that are almonds with no skin, whereas almond meal can be made both with whole or blanched almonds. The consistency is more like corn meal than wheat flour. This listing is for Almond Meal made without skin. Very nutritious, you can use almond flour to make low gluten versions of your favourite pastries and cakes. Almond flour is very moist, so it won't dry out your recipes. I've been using this almond meal with great success. Fresh & flavoursome.